In the Beginning, four mighty dragons raised of elemental energies were put to work creating the World. They were called Earth, Water, Fire and Air. When the work was done and the World set in motion, the four went to ground to sleep out this particular history, not to rise again till World’s End. It was Water’s Call that summoned the dragon Earth and his human guide Erde on a dizzying flight through time, from the war-torn German principalities of 913 to the West African coast in 2013. But this new future offers no safe haven from the perils left behind, for the passing centuries have plunged the world into a downward spiral of environmental devastation from which there would soon be no recovery. Earth and Erde had followed the Call in hope of a resolution. 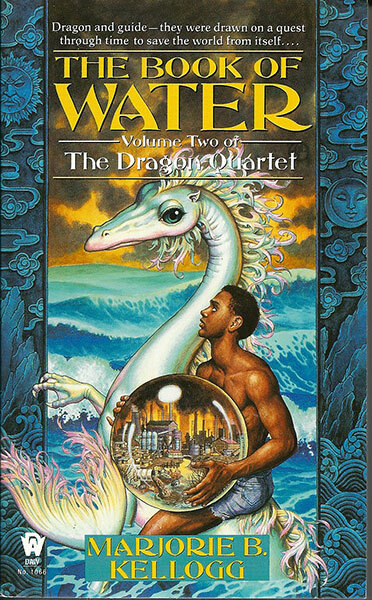 But shape-shifting Water, Earth’s sister, has more questions than answers, and besides, she has problems of her own: her fated human companion, a street-wise kid called N’Doch, has no interest in being a dragon guide, never mind getting mixed up in some ridiculous and inconvenient quest to save the world. But without him, the Quest cannot proceed.